YITH WooCommerce Deposits and Down Payments Extension: gives your customers the opportunity to book a product and leave a deposit, so that they can be sure that, thanks to down payments, the wished product becomes their own and it will not be sold to others. It happens that those customers leave the shop. Unless you give them the opportunity to book the product and leave a deposit, so that they can be sure that, thanks to that down payment, the wished product becomes their own and it will not be sold to others. 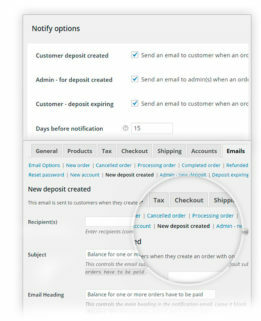 The plugin YITH WooCommerce Deposit and Down Payments can turn out to be an ace up your sleeve for you shop, especially if you sell middle- or high-cost products: certainly, the higher the price of your products the easier you can lose customers because they cannot pay the total amount immediately. 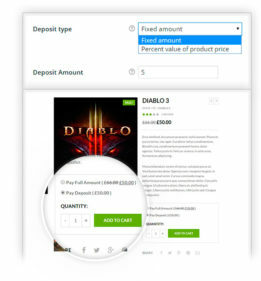 More than a reliable plugin, a guarantee: let your customers leave a deposit and, besides loyalise them, you’ll see your shop conversion rate increase.